A Maryland grandmother is trying to set the record straight about her daughter, a young woman who, she says, would never hurt her son, WUSA9 reports. On Friday, Romechia Simms was swinging her son for an "unusual amount of time," according to investigators, in a La Plata, Md., playground. She eventually drew the attention of Charles County officers, who immediately recognized that the 3-year-old, identified as Ji'Aire Lee, was dead. Simms has not been charged in the incident and is being treated at a hospital, according to the news station. "[Romechia] would never harm my grandson in any type of way. You know, I just believe she had some type of mental illness, some type of mental break that came upon her where she wasn't able to get herself out of that situation," Vontasha Simms insisted. The 47-year-old grandmother says that her daughter was diagnosed with a mental illness about three months ago and had been seeking help before she was found with the deceased little boy. Vontasha Simms told the news station that the park was about a mile away from the hotel where the family, who are homeless, have been staying. The grandmother noted that Romechia Simms suffers from depression. "I don't want people to look down upon her; I want people to use the situation as an opportunity to grow, learn from it. Like I said, help your neighbor. If you suffer from mental issues and you need help, don't be afraid to reach out to somebody," Vontasha Simms added. Police have not commented on any role that the mother’s mental illness might have played in the boy’s death, WUSA9 reports. Authorities are still attempting to make sense of the incident. They have put together a timeline of events and are requesting public assistance from anyone who may have seen the mother and child around the time of the episode in the playground. "This is a top priority for us. This is a 3-year-old boy that's deceased. We don't know the cause of death. 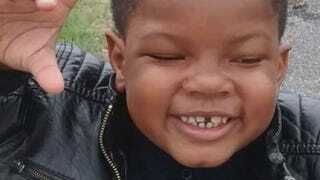 There are no obvious signs of trauma, but he is deceased, and our detectives are working around the clock trying to put information together to answer the question as to how this child died," Charles County Sheriff's Office spokeswoman Diane Richardson told the news station.